People with overactive thyroid glands (hyperthyroidism) may experience changes around their eyes. 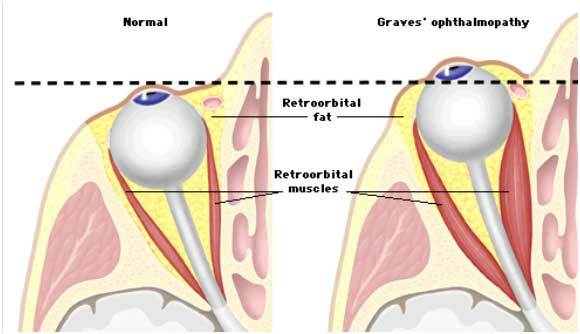 Thyroid Eye Disease (TED) or Graves Orbitopathy (GO) is the most common orbital disease affecting 1:20 people in UK. It affects more women than men, between the second and sixth decades. 25-50% of patients with immune thyroid disease develop orbital involvement commonly within 12-18 months of their hormonal disorder, and of these, 5 – 10% may develop more severe consequences such as severe inflammation and congestion, impaired motility, or compressive optic neuropathy. GO is associated with, but not caused by, abnormal thyroid hormone levels. TED is an immune mediated condition, generally associated with thyroid immune disorders such as Graves’ disease or Hashimoto’s thyroiditis. Most patients with eye disease have a current or past history of abnormal systemic thyroid hormone levels, while some may go on to develop abnormal levels, and a small number of patients may be euthyroid. Other significant factors include Smoking & a family history of thyroid disorders. Thyroid gland epithelial cells have surface receptors which bind thyroid stimulating hormone (TSH, thyrotropin), a hormone secreted by the pituitary gland to control the release of thyroid hormone. In both Graves’ disease and Hashimoto’s thyroiditis, circulating thyrotropin-receptor antibodies (TSH-R Antibodies, TRAb) are present which can bind to these same receptor sites, and initiate and perpetuate the disease. These circulating antibodies are thought to be mediators in orbitopathy as well, with the likely target being the orbital fibroblast. Orbital fibroblasts are present in the extra ocular muscles and in orbital fat. Orbital fibroblasts from patients with TED have increased numbers of TSH-Receptors, which are thought to bind to circulating autoantibodies (TRAb), stimulating adipogenesis and deposition of hyaluronic acid within orbital muscle and fat, the histologic hallmark of TED (see figure 1). 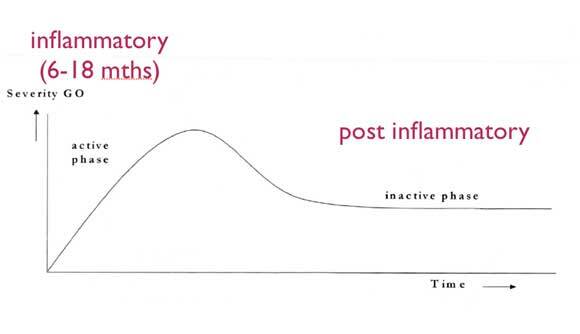 TED typically has a progressive (active) inflammatory phase, which can last b/w 6-18mths, followed by a stable (inactive) post-inflammatory phase. The steepness of the graph in the active phase reflects the speed of progression, with a steeper slope often leading to more serious side effects, which need to be actively managed usually with the use of steroids, radiotherapy, or other immunosuppressive agents, to limit the destructive consequences of the active phase. Rarely the disease can reactivate, often associated with a major life stress. Quit smoking – please seek professional help for this, as smoking is known to adversely affect the course of GO & your response to treatment. Frequent monitoring of your thyroid status – every 4-6 weeks. Aim to achieve & maintain euthyroid status – This needs to be overseen by an endocrinologist using medications or radioactive iodine or thyroidectomy. Note : Radioactive iodine is contraindicated in young children, women, pregnancy & severe eye disease. TED eye signs are graded into activity (on a scale of 0 to10, based on inflammatory signs) & severity (mild, moderate, severe & sight threatening). Mild non inflammatory disease is generally treated with lubricant drops & oral selenium (200 mcg/day for 6 mths), whilst mild inflammatory disease may need additional non steroidal anti inflammatory drugs (NSAIDS) or steroids. Double vision is managed with stick on Fresnel prisms. Immunosuppressive treatment with steroids, radiotherapy and surgery in the “active” phase is reserved for moderate & severe, sight threatening eye disease with an increasing inflammatory index. Pulsed Intravenous methylprednisolone has been found to be 85% effective, and oral prednisolone 60 % effective in reducing inflammatory signs. Other immunosuppressive drugs like Azathioprine, Cyclosporine & Rituximab are also used in some cases. Urgent Orbital decompression is an treatment option for sight threatening dysthyroid optic neuropathy, whilst lid surgery is reserved for corneal exposure threatening sight. Radiotherapy has been found to be useful in active progressive disease. Rehabilitative /restorative surgery is offered once the disease is stable & quiescent in the post inflammatory phase. This includes orbital decompression for “bulgy eyes”, squint surgery for “double vision”, lid lowering surgery for “ starey eyes” and blepharoplasty surgery for “eye bags”. Shortt AJ, Bhogal M, Rose GE, Shah-Desai S.
Orbit. 2011 Dec;30(6):280-8. doi: 10.3109/01676830.2011.604897. Nutting CM, Shah-Desai S, Rose GE, Norton AP, Plowman PN. Eye (Lond). 2006 Jun;20(6):645-8. Epub 2005 Aug 26.